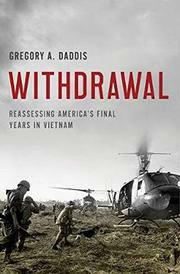 A historical revision of the last few years of the Vietnam War. In this fine, thoroughly argued book, Daddis, the director of Chapman University’s MA Program in War and Society and the author of two well-regarded books on the war (Westmoreland's War: Reassessing American Strategy in Vietnam, 2014, etc. ), tackles the relatively understudied final years. He engages with a revisionist theory that emerged a few years after America’s withdrawal from the war, an argument that took a handful of different forms. For these revisionists, who tended to be defenders of the war and its legacy, the U.S. did not lose the war but rather lost the peace—or if it did lose the war, it was not a military defeat but a political one caused by weak-willed politicians who refused to carry through on the military’s pending victory. At the heart of this “better war” narrative is the changing of the military leadership in the wake of the 1968 Tet Offensive as Gen. Creighton Abrams led the U.S. forces away from the failed policies of Gen. William Westmoreland. In reasoned prose, Daddis, a retired Army colonel who served in both Operation Desert Storm and Operation Iraqi Freedom, eviscerates this revisionist argument. He takes readers methodically through the realities of Vietnam from spring 1968, showing how the change in strategy was not that profound in terms of its impact on the ground, that the separation of military from political policies represents a false dichotomy, and, perhaps most importantly, that the argument that the military could have won the war had the politicians only unshackled the military utterly ignores, among other elements, the agency of the Vietnamese people. Furthermore, the author reveals how the “better war” argument has real, modern-day ramifications, manifesting in equally flawed arguments about Gen. David Petraeus’ so-called “surge” in Iraq in 2007. Solid scholarly history that should arouse spirited arguments among historians and will also appeal to a wider audience.